The Health and Social Care Information Centre‘s (HSCIC) Indicator Portal is a treasure trove providing detail down to GP surgery or hospital level on everything from mortality and disease prevalence to patient experience. But it also includes socioeconomic data, like the proportion of people in an area who have been out of work for over a year, the number of robberies in an area, and homelessness, plus education and environmental factors. There’s quite a time-lag on most of the data, sadly – sometimes it’s from 2011 – so it’s best for background rather than new information. 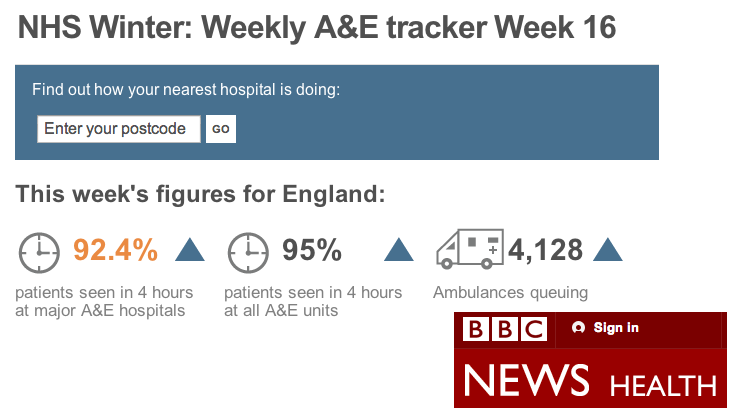 If you want really up to date information it doesn’t get much better than the SitReps published by NHS England, which provide information on A&E admissions and waiting times for the last week. The HES section of the HSCIC site contains all sorts of information about how patients are admitted to hospitals and what happens to them, including maternity services. The navigation on the site is not particularly easy to follow – for example many of the most useful links are on the right hand side of the page. Also, a lot of the data is only at aggregate level – try adding the phrase “Provider level analysis” or “by provider” in the search box to get more detail by hospital or trust. It’s not timely but it is more timely than the Indicator Portal – in March 2014 you can get data up to December 2013. Helpfully, the site does provide a publications calendar, so you can plan ahead for future releases. Not all data about health is published by NHS England or the HSCIC. 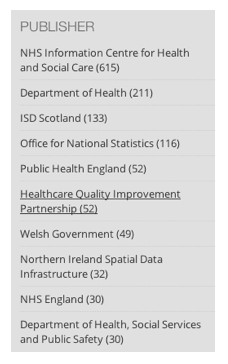 The central Gov.uk website’s Publications section allows you to subscribe to email updates or RSS alerts when new information is published that covers the topic ‘National Health Service’, or comes from the Department of Health – or you can simply choose those containing a keyword such as ‘health’. You can also choose to get updates on all publications, including research and consultations, or just statistics. 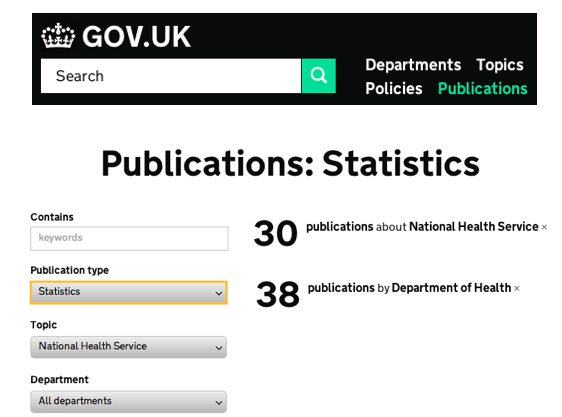 A similar central repository is the Data.gov.uk website, which allows you to search by keyword, select the ‘Health’ theme, or browse by publisher (department or body). There’s a lot of overlap here, but you may find data on one which isn’t on the other. There’s plenty of data released in responses to FOI requests. Getting hold of those isn’t easy, however, as there are hundreds of bodies which potentially could publish responses. Some are published on the Gov.uk publications site listed above, but it’s also worth subscribing to an email or RSS alert from the FOI request site WhatDoTheyKnow. You might try a broad search like ‘health’, or a type of organisation, like ‘CCG’. Another useful source is Parliamentary written answers: these are responses to questions from MPs and Peers and often include tables of data. You can use the sister site TheyWorkForYou to search written answers specifically (use the drop-down menu for Section) and/or specify that you’re only interested in answers from the Department of Health. Here’s an example search for ‘health’. The Care Quality Commission (CQC) inspects a range of health services, from hospitals and GP surgeries to dentists and care homes. It publishes some (not very useful) data that basically lists details on the “places that provide care”, including the date last inspected. But its most useful data – results from almost 100,000 inspections, comes from browsing its directory and clicking on individual links. Also worth looking at is the National Audit Office, which has a section of reports on health and social care. NHS National Services Scotland has its own Information Services Division, there’s a Scottish Public Health Observatory, and Scotland’s government has a page on health statistics. Audit Scotland publishes audits on council performance including issues related to health, such as social care. Wales has a number of data sources including the statistics section of the Welsh Government website; NHS Wales‘s data page; and StatsWales‘s data on health and social care. The Wales Audit Office is another useful source of health reports. In Northern Ireland the Department of Health, Social Services and Public Safety is the first port of call, with data on public health just one of a number of areas available in its statistics and research section. There’s also Health and Social Care in Northern Ireland‘s Public Health Agency, which publishes surveillance data on infectious diseases, vaccination and specific infections, and the Northern Ireland Audit Office. If you’re trying to trace a document trail or identify who is accountable for a particular decision, it’s essential to understand the structure of the health service. The way the National Health Service is set up in England (Scotland, Wales and Northern Ireland will be dealt with in future posts) can be complex but it is relatively simple once you understand how each department works. As the structure is now you have the Department of Health (DoH), led by the Secretary of State for Health, who in turn leads DoH ministers. The DoH funds ten strategic Health Authorities (SHAs), who are responsible for 152 Primary Care Trusts (PCTS), which in turn provide hospitals, mental health trusts, ambulance trusts, GP practices, dental practices, pharmacies which will also cover sectors such as primary care service, Foundation trusts, NHS trusts, private companies and charities. The new proposed structure for April 2013 will look slightly different as the Primary Care Trusts and Strategic Health Authorities will be replaced by NHS Commissioning groups, which are constructed of 200+ Clinical Commissioning Groups (CCGs) that will be led by GPS who will oversee and manage the community, as well as acting as representatives for the boards such as NHS trusts, Foundation trusts, private companies etc. There will also be a new feature, which will be added to the NHS in England, will be the new group Healthwatch England. A national body representing the views, opinions of the people who use health and social care services, ot will represent a large network of local Healthwatch groups (taken over by LINK), which will be funded by local authorities. It is claimed that these Healthwatches will help improve the services from the views of patients and carers during local commissioning decisions, the purpose being to make them run more efficiently, fairly and smoothly. What is the department of Health’s organogram? In December 2011 the Department of Health published an ‘organogram’. This is a database system which shows detailed info on the structure and costs of the department of health staff posts i.e. senior posts and costs of junior staff of the organisation as at 5 December 2011. For example: the senior posts spreadsheet lists a variety of job titles such as private secretary, senior communications manager, executive assistant, Business manager, HR officer, press and media officer, and finance manager. These all report to the overall professions such as Operational delivery, communications, human resources, informational technology, Policy, Internal audit, Informational Technology, Knowledge and Information manager etc. Knowing where different roles report to can save you a lot of time in identifying who you need to approach in asking questions. The junior posts (CSV) are responsible for different functions within the department such as leadership management, Internal audit efficiency strategy officers, Policy research programmes, PR, HR roles, NHS communication etc. All junior posts report to the senior posts and the Department of Health, which covers money and costs. Can you add anything? Or are there areas that need expanding or clarifying? Please let us know.